“Do you have any ideas for docu-soaps?” the network executive asked me out of nowhere. “That depends. What’s a docu-soap?” I asked. I was in a meeting my TV agent had set up during a visit to Los Angeles. I knew just enough about these shows to know I did not like their proliferation (how many weird jobs are there? ), but I could not resist the temptation to offer my own satirical one-upping of the genre. “Oh yeah. I have an idea. How about Fire Road Truckers?” I offered. “It’s like Ice Road Truckers, except the road is on fire, and the truckers have to cross it with flammable cargo like lumber or fuel tankers!” I would totally watch that show. It would have a tagline like “If you can’t stand the heat, get off the road” or some such nonsense. So far that network hasn’t made Fire Road Truckers, but the show easily could have been part of New York City PBS affiliate Thirteen’s recent satirical ad campaign. When I read about the campaign, I smiled. Not just because Fire Road Truckers had a chance at life again, but because if a staid and earnest voice like PBS was embracing comedy in its marketing, that meant a certain validation of my own views. Given that a) the world is becoming overrun with continuous and ubiquitous marketing messages, and b) consumers (aka “people”) have more control over how we direct our attention than ever before, gaining and maintaining people’s trust is getting harder. Humor, with its power to connect to people emotionally and deliver a truth indirectly, offers a way to cut through the noise and confusion while being real. My former role running digital for The Onion and, more recently, marketing my book, How To Be Black, often leads people to ask me how humor can be used by non-comedic brands and organizations. Their concern is that it makes sense for The Onion or a comedic author to use such techniques, but what about a tech company or anti-poverty initiative or tampon maker? I’ve spoken on this phenomenon in politics, business, and technology repeatedly over the past few years. It comprised the heart of my SXSW keynote in March 2012, and it’s a large part of why Brian, Craig and I founded Cultivated Wit. Should you be using humor in your own promotion and marketing? What lessons can be applied from the comedic arts? What about offending people? There are several good articles (and even books) exploring this subject including Jacqueline Smith’s post at Forbes on 10 Reasons Why Humor Is Key To Success At Work and Drake Baer at Fast Company on Why Humor Makes You More Creative. However, I’d like to focus on six lessons from my own experience. This past SXSW I teamed up with Paul Valerio, a researcher at experience design firm Method, to discuss in depth what people charged with “innovation” can learn from standup comedy. The principles we explored (based heavily on Paul’s own white paper) apply to marketing in general, and we can see them in practice in the PBS example. Know your audience, then ignore their advice. Thurston talked about comedians “knowing the room,” and how it’s based on gut feelings and trust. If you feel you’ve earned your audience’s trust, you can ask them to go beyond their comfort zone. The key for innovators: Don’t wait for your customers to tell you what they want. First earn their trust, then have confidence in your ability to understand their needs better than they do. Keep it fresh. So you’ve found something that’s working — when do you move on? Thurston says some comedians throw out all of their material every once in a while, but that it might be better to try to rediscover something new about your old idea. “You can find a lot of new in the old,” he said. Develop your own point of view. Comedians frequently work from the same stock ideas — awkward situations, relationships, the day’s news. In an age when nearly everyone has a platform to get their message out, having a unique point of view is paramount. In both comedy and innovation, crafting a “familiar surprise” out of common elements can carry the most weight, Valerio said. It’s that much more satisfying when we discover something that we didn’t previously know we wanted, he added. Don’t expect everyone to get it. Thurston said the a mark of a good idea may be that not everyone accepts it. Valerio added that good branding can be about sacrifice — about what you say no to. Don’t try to appeal to everyone. Try to excel within the group that does get it. You can’t test your way to a decision. “Research is an aid to judgement, not a replacement for it,” Valerio said. Thurston added that comedians don’t have much of a choice — they launch their ideas every night and learn on the fly. The key is that you can’t seek permission from the consumer through endless testing; creative decisions are yours to make. Beyond the tips above, I highly suggest you check out Method’s post-SXSW blog post in which they capture the some of the Q&A along with Paul’s answers. The more we look for it, the more we find (and intuitively understand) the power of humor as a method of outreach and engagement. Many months ago, Brian, Craig and I discussed the case of a tampon company’s comedic response to a hater on its Facebook wall. To bring it back to PBS, most of us know how dry and uninspiring the annual public media fundraisers can be (“If you call now, you’ll get three matching tote bags instead of just one!”). 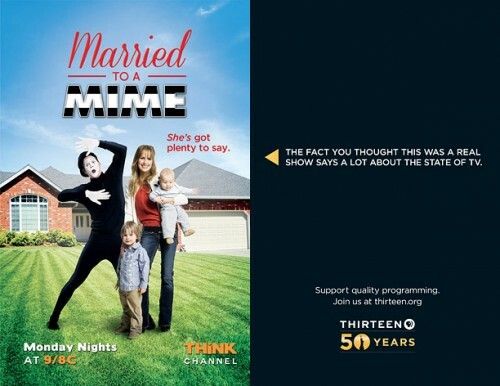 Complementing that existing campaign with a satirical takedown of public programming is a far more interesting angle and lets all of us know that the folks at Thirteen live in the same world as us. It makes them one of us. In choosing to mock the television landscape through satirical example, Thirteen has also adhered to one of the most important tenants of comedy: show, don’t tell. For clients, for curiosity, and for fun, we will keep exploring this world of humor-based marketing or comedy-infused creativity or my own favorite, “Applied Satire.” Thoughts or questions or threats? Use our advanced interactive discussion platform below, or fling text and media upon our Facebook page.